The Lunar Excursion Module (LEM) was on display to the public at the 1964 New York World’s Fair, in the “US Space Park” sponsored by NASA. The theme of the fair was “Man’s Achievement on a Shrinking Globe in an Expanding Universe.” My parents visited the fair and shortly after I made a miniature model and have loved the LEM ever since. Today the Grumman Lunar Module LM-13, from the cancelled Apollo 18 mission, is on display at the Cradle of Aviation in Garden City, NY. During my visit to this museum to take photos and gain inspiration for my project I was given a sample piece of the Heat Shield Mylar used on the LEM. 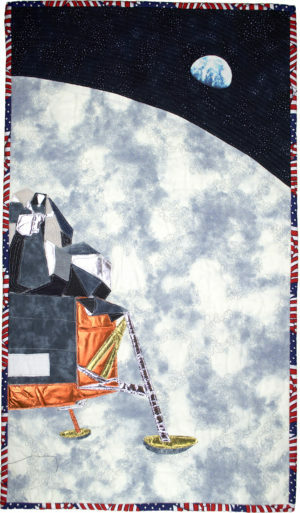 In this quilt I have used Mylar, reflective parachute material from a company that manufactures parachutes for NASA and on the back I used vintage fabric from the 1964 New York World’s Fair where technology was front and center and everyone was excited for the future. Looking back, NASA and the Apollo program ignited the world’s imagination and supported many new inventions that have propelled us into the 21st Century. It’s amazing to think it all started with the Lunar Lander (LEM) successfully landing on the moon and giving everyone a new perspective of ourselves, our abilities and our planet Earth.